Happy 35th Anniversary to The Tom Powers! Started in 1980, the Futurity is the oldest continuously operating pleasure futurity in the World. Entries now total well over 1000 and paybacks for last year were over $250,000.00 plus trophies and special awards! This Berrien Springs, Michigan event is unique in that it still held outdoors. The All American Quarter Horse Congress is the World’s Largest Single-Breed Horse Show. The show receives more than 17,000 horse show entries and will house more than 8,500 registered American Quarter Horses during its three-week schedule. The Congress attracts more than 650,000 people to the Columbus area, bringing more than $180 million to the central Ohio economy. The Appaloosa Horse Club offers programs suited to each member’s individual needs and goals, including Non-Pro and Youth programs. Becoming involved in ApHC show programs opens the door to a world of challenge and excitement. 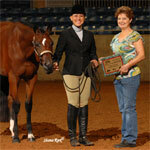 Join a tradition of excellence and thousands of ApHC competitors; there’s no limit to what you can achieve! Thursday, June 28 at the Triple Challenge Futurity will feature the SOUTHERN BELLE BREEDER’S DAY. Fourteen Breeder’s classes will be offered with the highlight of the day being the 3 Year Old $2500 Novice Horse Western Pleasure Slot Class with an estimated purse of $50,000.00! Additionally, the Southern Belle has decided to combine their Southern Belle Invitation July 2012 show with The Stars and Stripes and The Big A 2012 show. The combination of our affiliations with high profile shows, now allows us to guarantee more added money than previously in the history of The Southern Belle Invitation.